Advice on making farming systems sustainable is the backbone of Ant McConville’s advisory work. The Toowoomba-based agronomist with 26 years of experience has embraced the concept that natural predators of pests and chemistry can work hand in hand to deliver a farming system which gives growers greater control, confidence and certainty. This has required a mindset change from many of his customers, who may not have thought this was possible prior to working with him. “There is a whole new world of growers who are now interested in sustainability,” he says. Ant has established his own consultancy business – Eco Ag – which focuses on providing agronomy support which is ecologically safe. 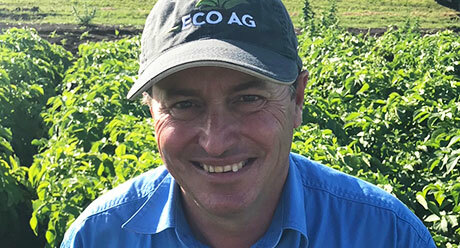 He works with growers to develop Integrated Pest Management Strategies to control challenges in vegetable and broadacre crops across the Darling Downs and the Lockyer Valley. Ant also has a strong involvement in research and development, working with government departments and private chemical companies like Syngenta to stay abreast of new chemistries which can be utilised to deliver effective pest and disease management. Sustainability is a passion for Ant. “I am interested in the future of agriculture and sustainable farming practices to ensure its longevity,” he says.